It’s one of the great paradoxes of working for yourself and creative work generally. The same people who relish being their own boss, forging the direction of their own work, and earning money entirely from their own ideas also tend, almost uniformly, to hate marketing. Even more specifically: selling. Which is, unfortunately, the key driver of business success. But does the fact that plenty of right-brained people have learned not only to make a living through their passion but a good one at that mean they are better at sales than you? They’ve just learned how to make it more palatable, trick themselves into marketing even if they think they’re terrible at it, or attract an audience that does much of the work for them. If you hate sales or simply think you’re bad at it, use these three approaches to put your business in high gear and your fears in the rear view mirror. 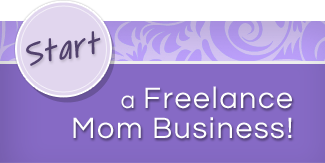 One of the biggest things that hold Freelance Moms back from growing their business’ sales is the hurdle of putting yourself out there. There are a lot of issues around the legitimacy of your business, your hard work, and even yourself that can come up in sales if you’re not careful, and it’s a common misconception that sales people are simply pushy or don’t care what people think about their assertive attempts to close deals. But the reality, and one of the first things that any future sales person learns, is that it is about numbers, not you. You may approach someone who desperately needs your services, like an overwhelmed business owner who has been wishing for a virtual assistant for months, but when your prospecting email hits her inbox, she doesn’t see it or doesn’t respond because she is overwhelmed with work—the very work she needs your help with! Or, if you’re a web designer, you may hit a prospective client who is already planning his site redesign right when he is in the midst of negotiating a new contract with the designer he used last time, and it’s not going well, but he can’t quite cut the cord yet because he needs some files that only the old designer has. In both cases, it’s easy to think that the prospect never got back to you because they weren’t interested in your background. That you had a typo in your email that you missed. Or that they read your email and thought you simply weren’t qualified enough. I’m not advocating, by any means, pinging prospects a day after your initial communication, or continuing to follow up until you get a response (once or maybe twice in a marketing campaign is sufficient), but you can’t discount the fact that most people will not get back to you for a variety of reasons that have nothing whatsoever to do with you. Games are about winning, right? And I just said you have to stop thinking about results. But the marketing metrics game isn’t one you should play with anyone but yourself. Rather than track how many cold leads turn into sales or how many new clients you bring in, one of the best ways to market when you hate it is to ignore those deal-oriented numbers and focus on the process. If you’re a graphic designer who primarily works with small, local businesses, what would it take for you to get a big business client? You may think you need to revamp your portfolio or overhaul your pitch, but maybe you don’t. Set yourself the challenge of sending a letter of introduction to 50 or 100 or 150 big business marketing directors. Don’t set a goal to close a deal, but just to do the hard work of taking the first step and see where it takes you. So, 50 to 100 might sound like a huge number, but remember it is a numbers game. This game approach also applies to regular client needs rather than trying to land a big, different, new fish. When you segment your marketing efforts like this, it’s easy to ignore the fact that you’re selling your ideas in the beginning when you do the prep work because you’re not actually selling anything yet. Then, at the end of the process, you still don’t feel like you’re selling because you’re just putting the last touch on some work you’ve had going all week. Whether you break your marketing process up or just pick an anxiety-free marketing goal to see where it leads, taking the pressure off your efforts through gamification (rewards are welcome!) both makes the work easier for you and makes your marketing come out more confident in the end. The advanced version of the previous two approaches is to combine them: marketing on a regular, consistent schedule that necessarily makes the process impersonal, because it’s just something you do, while making it a game, because it’s something on your to-do list that requires working to hit a production number. Scheduling a regularly recurring time on your calendar to handle sales and marketing works great for some people, who set aside all day Friday or two hours Wednesday morning and always and only devote that time to these tasks. Other people work from home because they need the flexibility it provides, so having a scheduled time is more likely to lead to procrastination than completion. For those women, having a weekly or monthly goal that you reliably complete but can do when convenient is a better approach. The key to making your marketing regular and repetitive is that it creates a pipeline of prospects, which means you are always flexing your sales muscles. Yaro Starak has a great visual of a sales funnel that I like. When you don’t let too much time go by without cold marketing, fear is less likely to build up. And when you are consistently having conversations with new prospective clients, closing some and passing on others that aren’t a good fit, the dialogues that come after your initial marketing salvo become easier because you’re less invested in each warm prospect that gets back to you so you close more calmly and with more confidence. Don’t Forget: You Provide a Valuable Service!! When marketing time rolls around, or you’ve got a hot prospect you’re working out a deal with, never forget: you are offering a needed service that has a valuable impact on your clients’ lives and businesses. Once you get into the habit of marketing and closing sales as a regular part of your business, this is something that you will start to feel automatically. But in the meantime, know that there is a prospective client out there who desperately needs what you’re offering. You just have to work the numbers and go through some folks who don’t need you (right now) to find them.